Sometimes the ideas won’t come. You want to paint or write but you don’t know what. You started something and now you hate it. Or maybe you’re trying to get started again after a drought or forced hiatus. Like a stalled car, you need a little push to get going. The way we think has a great impact on creativity. Divergent thinking creates possibilities. It gathers ideas and combines them in new ways. There is more than one answer to a question. And all ideas have potential value. Divergent thinking creates options using right-brained methods; imagination, visualisation, and intuition. Convergent thinking solves problems. It considers, weighs and discards options, narrowing them down until the right answer emerges. Convergent thinking achieves results using left-brain methods; sequencing, logic, and facts. We need both types of thinking to achieve a result. First, come up with ideas using divergent thinking, then execute an idea using convergent thinking. A brilliant concept is nothing without the techniques to make it a reality. But choosing which idea to work on too soon can choke off possibilities. We tend to judge ideas and discard them without fully exploring them. So it’s vital to gather all your ideas without judgement first. It’s like mining a fine diamond; they’re not lying about on the surface. After digging through a lot of worthless stuff, you spot something with potential. Then you get to work cutting and polishing. Creativity exercises are best done quickly to outwit the inner critic. Keep moving and let yourself be imperfect. Having too many choices can lead to being overwhelmed. Because you could do anything, you end up doing nothing. Research has shown that we are more satisfied with our choices when options are limited. Try letting chance dictate your next move rather than fretting over what to do.Then you can put your energy into doing, rather than frustration that you don’t know where to start. Turn to a page in the nearest book to hand. Count the tenth verb or noun. Set a timer for ten minutes. Write a story or poem inspired by this word. Do the same with a magazine, instead using the tenth picture as inspiration. Go to Pixabay or Unsplash for photos. Use the first image containing a yellow object as inspiration. This is a classic way to access divergent thinking. The idea is to generate quantity rather than quality. Concentrating on quantity leads your brain to think widely, past the obvious. Creativity sees new links between ideas or objects that were not connected before. Keep asking “what else?” but do not ask “would this work?” For example, a Lego brick could be a doorstop. It doesn’t matter at this stage how effective that might be. Most people can think of 10–15 ideas for a paperclip. See how much better you can do. Write down as many uses as you can think of for a paper clip; a Lego brick; a small silver coin; or a teaspoon. Pick an unusual use for an object and write a short story about it. Or draw it instead. Creativity blossoms within restriction. When we challenge our skills by limiting the available options, we have to find another way to get the job done. In other words, divergent thinking comes into play. That is the essence of creativity. Try thinking inside the box. Artists, paint or draw using shades of only one colour. If you usually draw in pencil, try using ink. Set a time limit. Writers, use a random first line generator like this one to write a one-page story. Sometimes this works better writing by hand; somehow it’s less daunting than the blinking cursor. To create we need to see the world in a different way. When we’re comfortable in one way of seeing, it’s good to mix it up. Maximise your creative muscle by trying something new, just as you’d train different muscle groups in the gym. You will benefit by finding new solutions and skills that you can bring back to your chosen field. That could be improved memory, attention to detail, or improvisation. And it’s fun to try something new. Make something small, in a different medium. Doodle your favourite animal, if you write. Write a song or poem, if you paint. Cook a meal using a new recipe or only three ingredients from your fridge. Look at an object in the room for one minute, then try to draw it from memory. The brain requires up to 20% of the body’s energy. That energy comes from circulating blood, and getting active improves circulation. Sitting or standing in one position for extended periods also leads to stiffness and even pain. Artists and typists are prone to repetitive strain injuries from small repeated movements. Spending long periods inside in solitary activity can have a number of negative effects, from vitamin D deficiency to low mood. We need to take care of our bodies if we want to stay healthy longer. Go for a walk and notice the animals. One of them will become a character in your next story or painting. Wander around a gallery, craft supplies store or even a toy shop. Surround yourself with interesting visuals to spark ideas. Running, swimming, walking or gardening are good ways to clear the mind and occupy the body with soothing repetition. This allows ideas from your subconscious to bubble up to the surface. The most important thing you can do to access creativity is to make more things, no matter how small or mundane. A new recipe, story, garden, doodle, or haiku all come from looking at the world, seeing new possibility and then expressing what you see in your own way. And that’s what creating is all about. 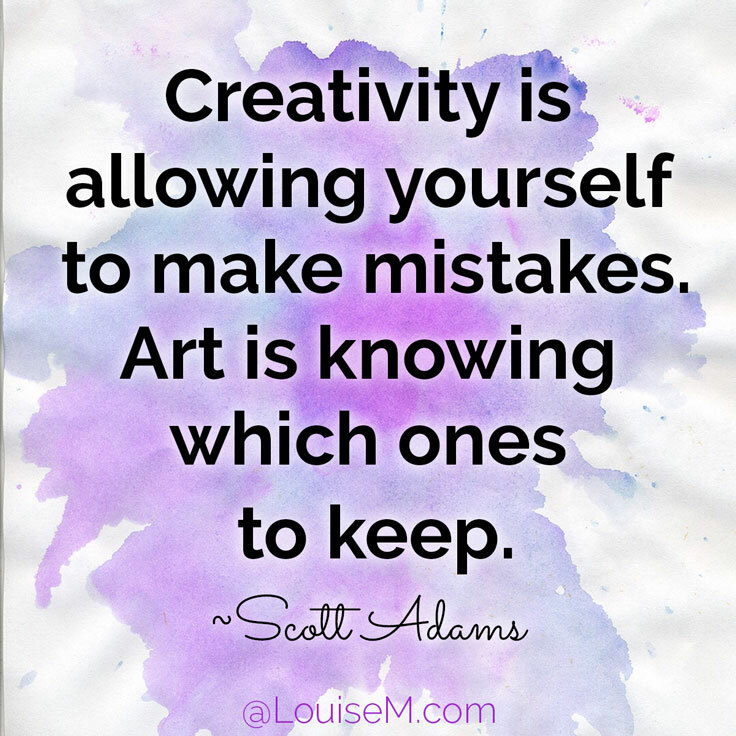 Creativity is allowing yourself to make mistakes. Art is knowing which to keep. Previous PostWriting karma: do you give as good as you get? I have found that writing in a new genre has been a boost to creativity. The flash fiction challenges via blogs have forced me to stretch my imagination. And as you suggest, limiting choices (as in a 99 word challenge!) is a push to create. I really appreciate your post. Powering through the block is not easy. Thank you! we all go through these periods where creating is too hard and we need a boost to get going again.